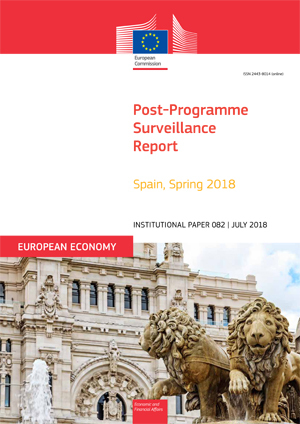 This report by the European Commission presents the findings of the ninth post-programme surveillance mission to Spain and identifies remaining challenges for the Spanish economy. Institutional Paper 082. July 2018. Brussels. PDF. 26pp. Tab. Graph. Bibliogr. Free. The European Commission’s top priority is to get Europe growing again and to increase the number of jobs without creating new debt. An investment plan will unlock public and private investments in the real economy of at least €315 billion over the next three years (2015-2017). The plan also focuses on cutting regulation and making smarter use of existing financial resources. The Investment Plan is already showing results. The European Investment Bank (EIB) estimates that by the end of 2015, the European Fund for Strategic Investments (EFSI) triggered around €50 billion of investment in Europe. Building on the enhanced EU economic governance, Europe needs to coordinate its economic policy more closely – to realise its full potential to deliver jobs, growth, social fairness and financial stability. Work is needed in 4 areas: economic, financial, fiscal and political union as defined in the Five Presidents' Report: Completing Europe's Economic and Monetary Union. See what other EU institutions are doing on economy, finance and the euroDid you find the information on economic and financial affairs you were looking for? Tell us what you think!